FAQs » Park touring at Disney World » What happens if a ride breaks down before I can use my FastPass+? You've been planning your magical Disney World vacation for nearly a year. You spent hours plotting out your touring plans and then, at exactly 60 days from when you checked in, you were up before the sun scoring the PERFECT times for your FastPass+ reservations. On the big day you head into the parks and just as you approach one of the rides to scan your MagicBand you realize that the lines aren't moving. In fact - they aren't even letting people into the lines at all. Is all that planning wasted? What happens if a ride breaks down before you get the chance to use your FastPass+? Disney World does a pretty good job with routine maintenance so while there are some rides that tend to break down more often than others, the vast majority of rides are pretty darn reliable. Unfortunately, the ones that tend to wreck havoc when they break down are also the ones that are the most popular (I'm looking at you Frozen Ever After and Flight of Passage). In addition, some rides won't run if there is lightning or heavy rain in the area. That's not because Disney is mean - it is for your safety and the safety of the Cast Members working that attraction. But, when a ride goes down that you have a FastPass+ for Disney doesn't leave you hanging. 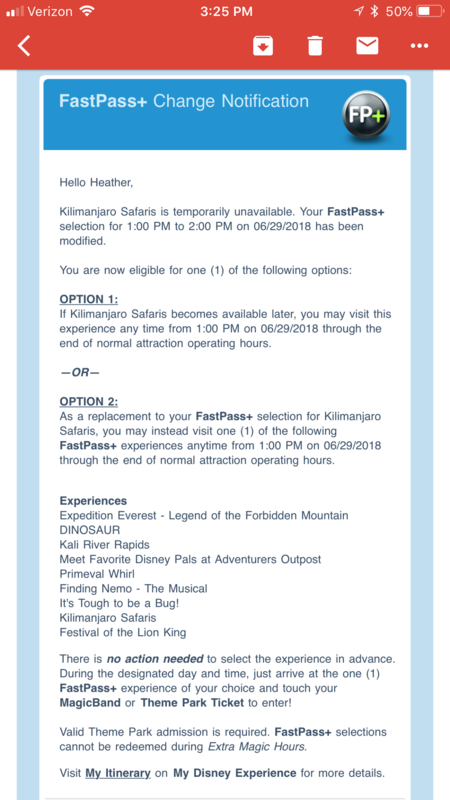 That email will tell you that your FastPass+ reservation has been modified and has been essentially turned into an "anytime" FastPass that will be good through the end of the day. You'll also get a notice in the My Disney Experience app. Wait it out. Your FastPass+ reservation will work on the original attraction it was for through the end of the day so whenever the ride comes back online, you'll be able to ride it. Use your FastPass+ on a different attraction. 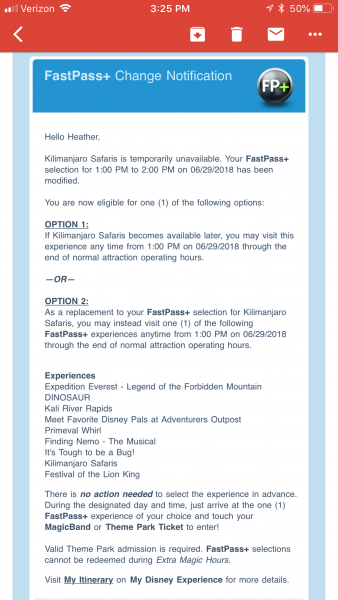 Generally, you'll be able to use it on any attraction in the same park EXCEPT for some of the Tier 1 attractions (things like Flight of Passage, Slinky Dog Dash, etc.). Your email will give you a list letting you know which attractions are eligible. When a FastPass+ is modified by Disney like that, you don't have to do anything. The system automatically knows that you have an "anytime" FastPass in your account so all you need to do is scan your MagicBand when you enter the FastPass+ line just like you would for any FastPass+. In many (if not most) cases rides that go down almost always come back up before the end of the day. So, while it may mess with your touring plans it doesn't necessarily mean you won't get to ride something - you may just have to adjust your schedule a bit. You can always check with the Cast Members at the attraction to see if there are any updates, although generally they won't know much more than you. But, sometimes they can have some insight that might help you decide which option is best for you. One last bit: When a ride has been down and comes back up, the FastPass+ line can get quite long for a little bit as all the people that had their FastPasses modified jump into line. If you aren't able to be towards the front of that group and you have the time to wait, give it 30 minutes or so and you'll find the FastPass+ line drops back down to a "regular" length for that attraction.